"Maroon 5" is our league champion, taking down "Team Hulk" in our last ever Dodgeball league! 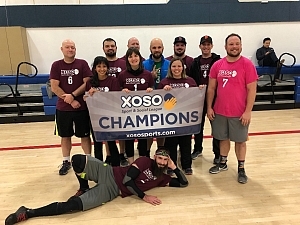 We had a number of quality squads, but it was "Maroon 5" who would come out of a pretty tough group of playoff teams to be crowned league champs! Our first game of the night featured our soon-to-be champs taking on "Adult Friend Finder" in the 1 v 4 match-up. In game 5, with the match tied, "Maroon 5" picked up a crucial win in sudden death to take a 3-2 lead. After the win they'd never look back, eventually winning 5-2. The next game of the night featured "Team Hulk" and "Mooseknuckles" in a match that featured two evenly matched teams. Unfortunately for "Mooseknuckles" it would be an early, disappointing exit, losing to "Team Hulk" 5-2. In the championship it was all about "Maroon 5" as they jumped on "Team Hulk" early and never let up. They were firing (and throwing) on all cylinders and built up a 5-1 lead. "Team Hulk" fought back to make it 5-2, but by then it was too little, too late. Overall "Maroon 5" finishes with an impressive 9-1 record. Their lone loss was on the receiving end of an 8-2 "Team Hulk" smash, but other than that it was all wins. They would also finish with a +22 point differential, good for 3rd in the league. "Team Hulk" and "Mooseknuckles" finished slightly above them wit ha +25 and +23 respectively. Congratulations to "Maroon 5" on the championship victory. These playoffs were certainly a fitting end to our dodgeball leagues!